The USMC inducted the AV-8A Harrier into service in 1971 and military minds in the DoD were quickly trying to think of every way they could use the "Jump Jet's" new abilities. 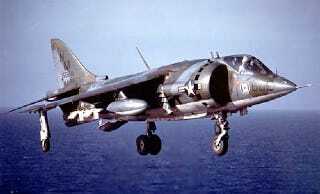 One of their experiments was to integrate the AV-8 into a conventional USN Carrier Air Wing. This happened during the USS Franklin D. Roosevelt's Mediterranean cruise in 1976. In 1974 the Harrier made its first deployment aboard a "Gator Navy" Amphibious Assault Ship, the USS Tripoli after being tested for shipboard computability aboard the same vessel earlier. Just two years later, fourteen AV-8A Harriers from Marine Attack Squadron 231 (VMA-231) "Ace of Spades" embarked aboard the USS Franklin D. Roosevelt (CV-42) from 1976 to 1977 to prove the concept of integrating the short takeoff and vertical landing (STOVL) Harrier into catapult and barrier configured carrier's normal Air Wing operations. During this historic cruise, the Marine Harriers worked alongside F-4 Phantoms, A-7 Corsair IIs and E-1 Tracers, participating in a whole slew of missions. These included their standard close air support (CAS) assignments, as well as sea control and even working as a within-visual-range interceptor, being guided onto their targets via shipboard radar or instructions from the E-1 Tracer Airborne Early Warning And Control aircraft. This resulted in the AV-8s intercepting Russian bombers and patrol aircraft, sometimes alongside their F-4 Phantom carrier mates, and sometimes not. Recoveries could also occur opposite the flow of normal operations during certain circumstances. In January of 1977, a pair of Harriers made bow approaches to the Roosevelt and landed aboard the carrier. This marked the first official time a fixed wing aircraft had made a bow-on, downwind landing aboard a US Navy fixed-wing carrier. Launching the Harrier off of the carrier was facilitated by a long guide line painted between the Roosevelet's bow catapults, starting amidship near the island. The Harriers would simply rocket down that line before turning their nozzles to a near vertical position, raising off the deck about mid-way down the bow catapult tracks. The historic 1976-1977 Mediterranean Cruise, the Roosevelt's last incidentally, proved that the Harrier could integrate with a modern Navy Carrier Air Wing seamlessly, even aboard a Midway Class carrier with its tight confines. Regardless of the cruise's massive success, the Navy and the Marines would not sail with a Harrier squadron embarked aboard a conventional carrier again. This may have been due to the Marines' fear that they would lose funding for their dedicated Amphibious Assault Ship helicopter carriers, or it could have been due to the Navy's fear that the success of the Harrier could see their massive, complex and expensive catapult and arresting gear configured carriers becoming less relevant. Other factors, such as the AV-8A's limited range and payload, and its dismal safety record, may have played into this decision as well, although many of these issues were overcome with the USMC's successor to the AV-8A, the McDonnell Douglas AV-8B Harrier II. It was not until 1988 that the Harrier officially returned to a US Navy catapult and arresting gear equipped carrier in the form of the aforementioned new and much more capable AV-8B Harrier II, although this was for testing and basic integration proof of concept purposes only. A small cadre of AV-8Bs were put through their paces aboard the USS John F. Kennedy (CV-67) while its massive Air Wing was also deployed aboard. Fast forward three years to Operation Desert Storm and the USS John F. Kennedy would once again see the AV-8Bs operating aboard, albeit in a much more limited and sporadic fashion than the USS Franklin D. Roosevelt's historic cruise with VMA-231 embarked aboard in 1976-1977. The Kennedy's Desert Storm combat cruise would also be the A-7 Corsair II's last carrier deployment. Since 1991, it is not clear if there have been any circumstances where AV-8Bs operated aboard a US Navy Super Carrier, and there have definitely been no cruises where they were integrated into a standard Carrier Air Wing. With the recent fielding of the USS America (LHA-6), the Navy's controversial new Amphibious Assault Ship that is designed almost exclusively with aviation in mind, Harriers will be operating from a ship that is as large as the USS Franklin D. Roosevelt they once flew from in force, although briefly, some 40 years ago.